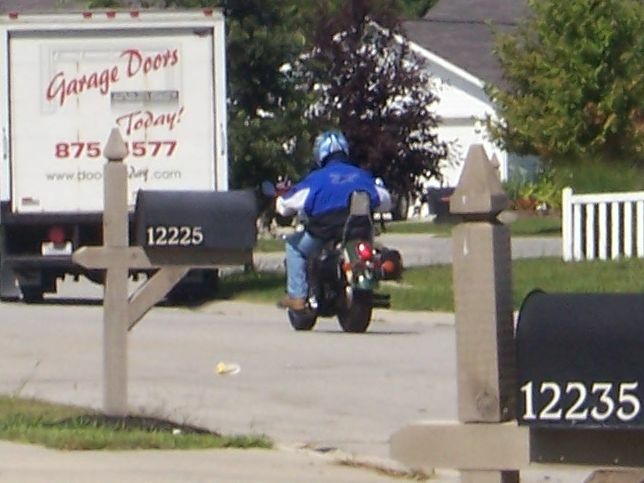 Yesterday I got a letter from the bank that “owns” my new motorcycle. They want the title. I just got the title this past week, and was waiting to register it until the next payday (since I was sick, we are short this month). But since they were breathing down my neck, I had to register it today. I called my insurance company and got the motorcycle insurance added. Then I drove to the Bureau of Motor Vehicles (in my car, since I haven’t been able to take my motorcycle anywhere since it didn’t have a license plate). I got to the BMV to get the plate, and the lady told me that I need to have the VIN certified (that it’s correct). I could call the cops and have them come out to verify the VIN, but I didn’t really think that was necessary. “Darla” at BMV told me that I “could” just ride it to the BMV sans plate, and get it when I arrive. I said, “Is that legal?” She said, “well, not really.” She then got me a “96 hour permit” to ride the motorcycle, which I then took home. Then I put on my helmet, my jacket, my gloves, boots, and my shades. I jumped on the bike and rode it to the BMV (about five miles on city streets). I got my plate, and now I’m legal. This was the first time I have ever been in control of a motorcycle. I rode a Puch moped in high school for a while, and this was absolutely nothing like it! It was exhilarating and nerve-wracking all at the same time. I ended up killing the motor twice on the way to the BMV (both while starting from a stop sign), and once on the way back. I am starting to get the hang of it, but there were times when I didn’t trust myself and so I elected to take the easy route. For instance, at one intersection I needed to turn left onto a road with no stop signs (I was sitting at a stop sign…it was a T intersection and the cross road did not stop…whatever you call that). I waited and waited for a good interval (I would have gone at several points in my car, but didn’t trust myself with the bike). The cars were piling up behind me, so I just turned right instead of left, drove down the road, turned around in the Target parking lot and came back. I’m getting the hang of it. The shifting is really easy (and to think that was the part I thought would be difficult). The clutch/throttle switching is easier than I thought (it probably helps that I can drive a stick). The major thing I have to work on is my turns. They are too wide. But hey, on my way back home, I actually shifted during a turn. Bonus points for difficulty!!! Oh, and Happy Birthday, Dad! >moving from a Learner bike to a big bike is a big step. its like learning to ride again as you have to be a lot smoother on the acceleration and watch your speed when coming into corners. I was fairly surprised that my Motorcycle insurance didnt go up that much when I crossed over to a bigger engine. its a far better experience of riding.